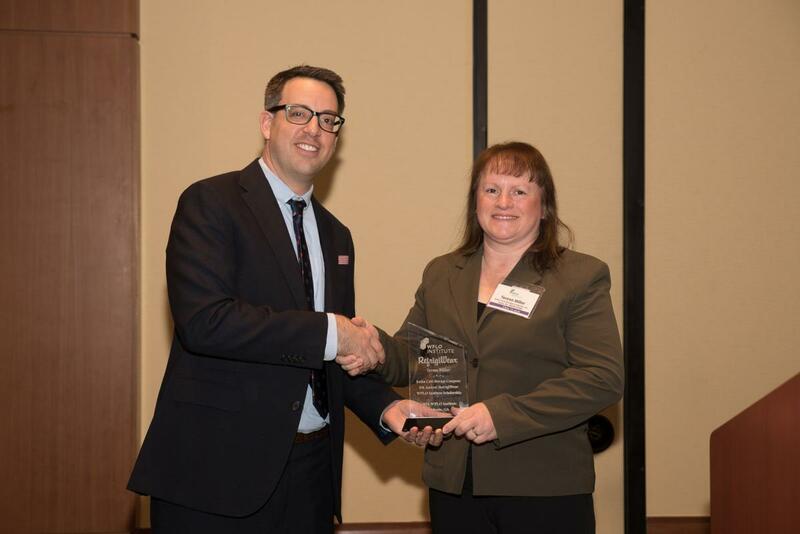 The World Food Logistics Organization (WFLO) and RefrigiWear announced that Teresa Miller of Sodus Cold Storage is the winner of the WFLO Scholarship for the 52nd WFLO Institute, to be held January 30-February 3, 2016 at the Georgia Tech Hotel and Conference Center in Atlanta, Georgia. Teresa Miller accepts the award from Ryan Silberman, RefrigiWear, Inc.
“I am so honored to receive this award and look forward to gaining a more in-depth understanding of the cold chain industry while at the Institute to ensure that our programs remain on the cutting edge of best practices in the industry,” Miller stated. For five years, RefrigiWear and the WFLO have awarded one student a full scholarship for the tuition and related expenses to attend the WFLO Institute, the cold storage industry’s premier training event. Recipients are selected based on their performance, leadership skills, and dedication to the industry. Miller started at Sodus Cold Storage as an administrative assistant and worked her way up by volunteering to help in any area needed and was promoted to a position overseeing safety, compliance, and facilities. Miller has attended the Global Cold Chain Alliance (GCCA) Assembly of Committees meetings and recently joined the association’s Safety and Government Affairs Committees. “Teresa demonstrated leadership by building the company’s Process Safety Management (PSM) program. Previously it was a bit disjointed with no one person driving consistency” says Sodus Cold Storage President Sandi Bishop, who nominated Miller for the scholarship award. “She is a member of our executive management team and works closely with everyone and mainly with the maintenance department to ensure our mechanical integrity is at a solid and documented level. I personally, and on behalf of Sodus Cold Storage, want to thank RefrigiWear for helping make this scholarship possible.” As the recipient of this scholarship, Miller will be recognized during the opening session of the WFLO Institute and at a dinner to be held in her honor during the event. In addition, RefrigiWear will bring Miller to its manufacturing plant in North Georgia for a tour. RefrigiWear Chief Revenue Officer, Ryan Silberman adds, “Teresa Miller is a great example of the type of emerging leader who can grow and succeed through this scholarship.” More information on the WFLO Institute can be found at www.wflo.org/institute. Comprised of its Core Partners, including the International Association of Refrigerated Warehouses, the World Food Logistics Organization, the International Institute of Ammonia Refrigeration, the International Refrigerated Transportation Association, and the International Association for Cold Storage Construction, the Global Cold Chain Alliance (GCCA) represents all major industries engaged in temperature-controlled logistics. GCCA unites partners to be innovative leaders in the temperature-controlled products industry. WFLO delivers education and research to the industry and empowers economic development by strengthening the global cold chain. For more information about GCCA and WFLO, visit www.gcca.org. RefrigiWear is a proud supporter of the refrigerated warehousing professional and is excited to further steward the best business practices the WFLO Institute puts in place. Since 1954, RefrigiWear has been the leading manufacturer of insulated clothing, handwear, headwear and footwear for any cold condition environment or situations where safety is a concern. RefrigiWear also offers the RW Protect product line consisting of insulated pallet covers, bags and blankets for the protection of temperature-sensitive products during storage and transportation, resulting in less product degradation. For more information visit www.refrigiwear.com.